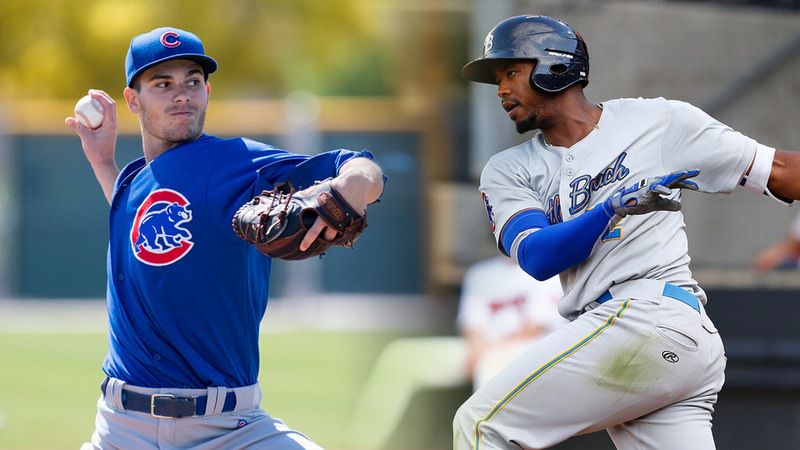 The White Sox added two more big names to their already stocked farm system, acquiring the Cubs' top two prospects, Eloy Jimenez and Dylan Cease, in a five-player trade on Thursday. Veteran lefty starter Jose Quintana was the centerpiece of the deal -- he was sent to the Cubs for Jimenez, the reigning Midwest League MVP, and Cease, the Cubs' top piching prospect. Minor League infielders Matt Rose and Bryant Flete are also headed across town in a transaction the White Sox confirmed just before 11:30 a.m. ET on Twitter. It's a huge haul for the White Sox, an organization that already boasts some of baseball's top-ranked prospects, including Yoan Moncada (No. 1), Michael Kopech (No. 11), Luis Robert (No. 23) and Lucas Giolito (No. 28). With Jimenez and Cease, Chicago will own nine prospects on MLB.com's Top-100 list. Jimenez, a 20-year-old left fielder, was hitting .271 with eight homers and 32 RBIs in 42 games this year with Class A Advanced Myrtle Beach. The right-handed outfielder earned his second Futures Game selection this summer, was named a Carolina League All-Star and took home a suitcase full of awards and honors as a Midwest League All-Star last season when he was named the league's MVP and Prospect of the Year. He was a Rising Star in the Arizona Fall League and was selected as an MiLB.com Organization All-Star for the Cubs last year after batting .329 with 14 homers and 81 RBIs in 112 games for Class A South Bend. Cease, 21, was 1-2 with a 2.79 ERA and 74 strikeouts and 26 walks in 51 2/3 innings across 13 starts this season in the Midwest League with South Bend. The 2014 sixth-round pick is ranked as the No. 63 prospect in baseball, was an All-Star this summer and named the Cubs' Minor League Pitcher of the Month for April. He missed time in May with a leg injury but rebounded nicely in June, when he posted a 2.03 ERA in four starts. Rose is a 22-year-old first baseman from Georgia State and was the Cubs' 11th-round pick in 2015. The right-handed infielder has struggled with his average but offers plenty of power -- he hit 17 home runs last season across two levels and is batting .227 with 14 homers and 38 RBIs in 65 games this season for Myrtle Beach. Flete, 24, signed with the Cubs out of Venezuela in 2012 and made his domestic debut two years later in the Northwest League. He's hitting .305 with six homers, 37 RBIs and a .355 OBP in 70 games this season as the Pelicans' primary second baseman. Quintana has not had a stellar campaign so far -- he's 4-8 with a 4.49 ERA in 18 starts for the White Sox, although he's signed through next season and has affordable contract options for 2019 and 2020, making the 28-year-old an enticing option for a Cubs squad desperate to stay in contention in the NL Central. At the time of the deal, the Cubs (43-45) are tied with St. Louis for second, 5.5 games behind Milwaukee. Last season, Quintana went 13-12 with a 3.20 ERA in 32 starts, earning his first-career All-Star selection.